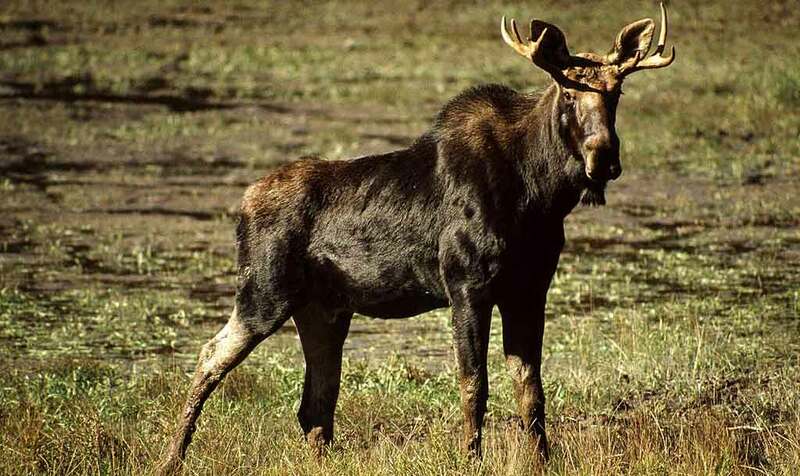 The moose did not get its name from the French dessert. Only crazy people think up such things. The name refers to the neat way moose strip bark from trees. You have to wonder about that one. We’re not here to second-guess the Native Americans, mind you, but let’s say you saw an animal that’s bigger than a horse and uglier than a cow, with a set of antlers that look like the bony hands of God. Would your first, second, or even tenth reaction be: “Wow, look at how smoothly he takes the bark off that tree!”? Maybe they hired a Dutch consultant. The British English word elk possibly came from the Swedish word “älg”, or “Elch” in German, and the Polish word “łoś”. To add confusion, the word elk is used in North America to refer to a different animal, also known as the wapiti. The word “moose” was first used in English in 1606 from Captain Thomas Hanham’s ‘Mus’, and in 1616 from Captain John Smith’s ‘Moos’, with possible mutual reinforcement in usage. Chocolate moose with squirrel sounds delish. How Did Idaho Get Its Name and What Does “Idaho” Mean In Native American? What language do Native Americans speak and Do Native Americans still speak Indian languages? How Did the African Country Mali Get its Name and What Does it Mean in the Bambara Language?